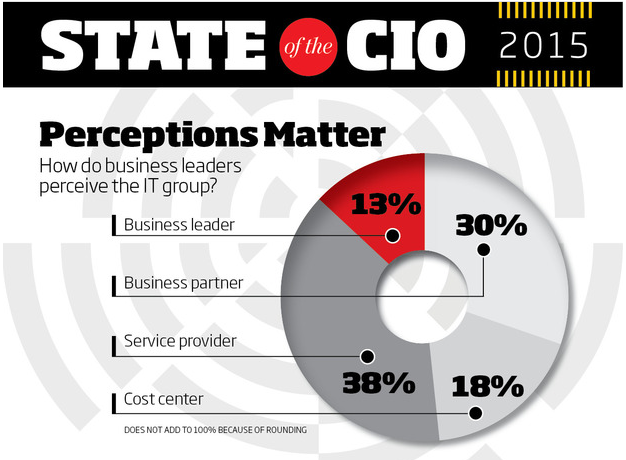 Perceptions Matter - CIO's Take Note - Eric D. Brown, D.Sc. CIO Magazine has released their “2015 State of the CIO” report. I look forward to this report every year as it provides some great insight into the minds of CIO’s and the roles they are playing within their businesses. This year’s report has some great content but I wanted to point out one particular aspect of the report related to ‘perceptions’ of the CIO and IT group. In the slide below – taken from the2015 State of the CIO report – results of questions related to how business leaders perceive the IT group within their organization are provided. For a small minority (13%), the IT group and the CIO are seen as business leaders. These are the CIO’s and IT groups who’ve figured out how to work in the ‘New’ world of business. These are the teams that view themselves as solvers of business problems, not technology problems. Another 30% of the respondents see the IT group and the CIO as business partners. I’m actually pretty excited to see such a large number. There’s a disheartening aspect to these results though with 43% of respondents calling their CIO’s and IT groups business partners or business leaders. The majority of respondents (56%) see their IT groups as a necessary part of the business but not something that truly creates lasting value for the business or the clients of the business. With 18% of respondents perceiving IT as a cost center and 38% viewing the IT group and/or CIO as a service provider, we see that many companies still view IT as just a budgetary line item rather than a real, value-driven part of the business. I’m sure there are plenty of CIO’s and IT professionals who believe they are more than a cost center or service provider, but based on the respondents in this survey, the majority of those folks would be wrong. I wonder how many CIO’s out there would put themselves in the ‘cost center’ or ‘service provider’ bucket if they were asked? Perception matters. How is your IT group viewed by your organization?